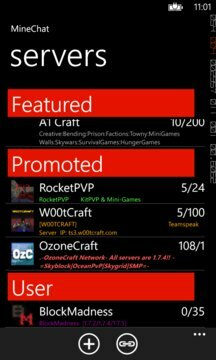 - MineChat does not work with servers that require client modification such as Tekkit. - MineChat will work over 3G/4G, but eats up a good bit of data and can run slow depending on your connection. So it is recommended you are on WI-fi when in using MineChat. - MineChat does not support Forge Modloader servers. - MineChat sends a spawn command automatically upon connection to help prevent your character from getting killed while using the app. However, not all servers support the spawn command or have delay before teleporting you which leaves your character vulnerable during that time period. Be sure you are aware how your server handles spawning. For additional information or issues when connecting, please contact us directly as we cannot respond to Windows Store reviews.